This absorbing and revealing book is part of the Voices series, published to give a platform to those unsung heroes from the past whose authentic stories have not been fully told. 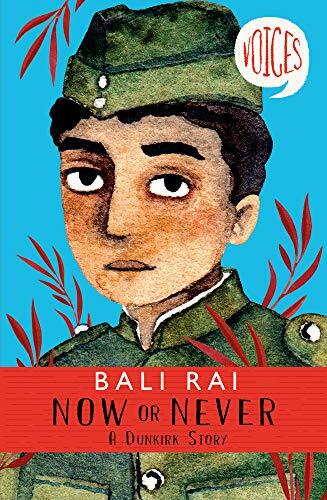 Now or Never explains the role of the Royal Indian Army Service Corps, sixteen hundred men who,in the Second World War, with mules and trained mulateers supplied food and equipment to British troops across France. Although their role in the war has been acknowledged in some prestigious quarters-for example, the Imperial War Museum-the media has not been widely used to acknowledge the vital role these men and their animals played. Fifteen year old Fazal Khan is proud to follow in his grandfather's footsteps and support the British Army in his role as mulateer but his enthusiam and naivete are gradually worn away as the war progresses and the advancing German troops eventually force the British into retreat to Dunkirk. The Indian soldiers encountered a degree of prejudice and hostility from their British counterparts and,in addition, during the retreat, had to abandon their beloved mules as they could no longer be fed. Fazal tries to stay loyal to the British but his close friend Mushtaq repeatedly reminds him that the war is not their war, Britain not their country and many British soldiers do not regard the Indian troops as their equals. Nowhere is this more apparent than on the beaches at Dunkirk, when, amidst the wholesale slaughter of the troops as they await rescue comes the order from High Command that all non-white troops should be left behind in the rescue operation. One officer, Captain John Ashdown, father of the politician Paddy Ashdown, refused to obey this order, stating that it would be morally wrong to leave the Indian troops behind. He remained true to his priciples and saw to it that as many men as possible from every creed were saved. He was rewarded for his efforts with a court martial, which resulted in him being stripped of his rank and his career ended. This simply written and moving book ends with a short tribute to Captain John Ashdown. Like Fazal, he believed in duty and, like Fazal, he saw that the men who he served under were too often flawed leaders.